Elk Grove City Council To Hear Costco Project; Will Pappas Hold Project Hostage in Pursuit of Economic Incentives? 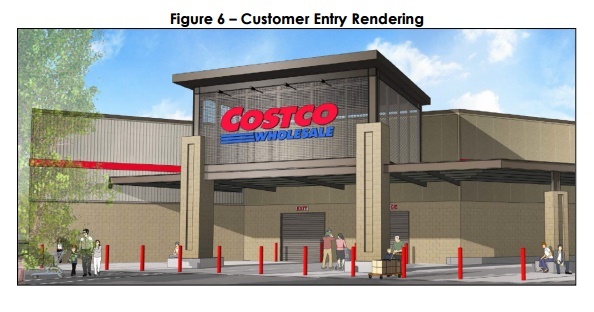 In what has developed into a relatively fast process, the Elk Grove City Council will consider approving the proposed Costco project at their Wednesday night meeting. The project, which was approved by 3-1 vote of the Elk Grove Planning Commission at their May 5 meeting, calls for a 150,000 sq. ft. warehouse store located near the southeast corner of Elk Grove Boulevard and Bruceville Road in the city's master planned Laguna Ridge area. As approved, the store will include a 24-pump gas station and sits on a 17-acre site. The staff report for Wednesday night's meeting recommends approval of the project with a qualified conditional use permit. However, the report issued a warning on the purported finances of the developer and its affiliated businesses, Pappas Investments, with regards to this specific project. The report says (on page 13) "The Property Owner has advised the City that the proposed lease with Costco will not be financially viable for the Property Owner, and the Costco Project might not proceed, unless the Property Owner receives an economic incentive from the City in an amount to be determined." Also, the report notes the City has not made any commitments to the request for incentives, but the matter is under study. If the City Council approves the project and if it considers any financial incentives for Pappas, it will be done at a future meeting. In the past, Elk Grove has extended economic incentives to several car dealers who opened in the Elk Grove Automall as well as Pappas Investments. As part of the deal that brought the California Prison Health Care Services to the City in 2011, the City Council awarded $1.9 million to the prison health care agency and $1.5 million to Pappas Investments. Pappas Investments, which has been deeply involved in the development of the City and continues to exert its influence, has also been a politician patron of most of the city council members since the City's 2000 incorporation. Pappas will once again test the return of that political patronage investment with the Elk Grove City Councilmen should they decide to pursue more economic incentives under the threat of killing the project. The community/taxpayers thought they were buying into one type of commercial entity only to now discover a few weeks later that the developer's plans had changed and they now need a taxpayer incentive to complete the project. Is that not a "bait-and-switch" tactic? The city doesn't come with the incentive...no Costco? The City doesn't have the money to complete the Aquatics Complex, Animal Shelter, street maintenance or soccer fields for our youth and will be placing CFD's on many properties this same evening. It's past time for our City to get their heads out of the sand and do what's right for the taxpayers of this city and stop the Developers from holding us HOSTAGE. For once, let us hear you say "enough is enough". The word is out that Elk Grove is an easy mark. You have five egotists who choose re-election over the good of the taxpayers, and allow themselves to be held hostage with our money once again. Gil Moore threatened no MacDonalds if they didn't get a freeway sign, so up goes the plastic elk on a towering billboard. Pappas gets a rezone of the Capital Nursery site and will jam cookie cutter houses into a faux high-end gated project next to Walmart! Pappas builds expensive offices during the peak of the market so he can't market them competitively today with newly built offices in the region, so he suckers the City into a $1.5 million payout to help underwrite his prison deal. Pappas' timing is bad as far as the election is concerned, because the 5 leaders would have preferred to keep this hushed up in light of them trying to peddle a sales tax increase on us, as well as raising the CFD tax assessments. But Costco, presumably signed a contract to purchase the site, but Pappas probably advised them to not worry because the 5 leaders are good for a good chunk of change--our change. I'll bet you a slice of that famous Costco pizza that the sweetheart deal is a slam dunk, but you know where they can shove that sales tax measure. I'm OK without a Costco if it's going to cost tax payers another dime. There are plenty of other developers that will step in without a taxpayer handout. Tank the deal and hold strong, because this extortion tactic belongs in New Jersey, not Elk Grove. If you can't bid a project or structure a deal correctly before it goes to vote, don't expect government to bail you out. It's not Costco that's gonna get the money-it's Pappas. Pappas knows he has 5 puppets that will enable him to throw in a last minute extortion to get a higher sales price to Costco, knowing the city is an easy mark and will kick in the difference. He waits until after the Rubber Stamp Commission approved the project 4-1, then throws in the last minute extortion when city leaders can smell the sales tax dollars. Why didn't the sales price issue come up 6 months ago or longer when the deal first went down?